Your best source for corporate and team options –LEt US help your team look great! Superior Team has a reputation for quality work, prompt delivery, and outstanding customer service. We work hard to ensure that you receive the highest quality finished products for you and your company. Only the most technologically advanced equipment is utilized to create any design you can imagine. Our superior team is here to work with your team to make your ideas happen and get the awareness they deserve. Questions? Ready to place an order? Group ordering just got easier! Let us create a custom store for your group or team - provided FREE as part our design service. Accessible on any device, anywhere! Your privacy is very important to us – your information is never sold, and we will never spam you. What Can SUPERIOR TEAM DO FOR YOU? Superior Team Apparel's custom work stands out against the competition. We understand you and your needs when it comes to offering quality and craftsmanship. Superior Team Apparel was founded in 1999 and is a Division of Pearison, Inc. and sister company to Band Shoppe. Superior Team Apparel creates high-end embroidery and appliqué for Band Shoppe's Marching Band Uniforms. With a life cycle of 10 years, uniform embroidery has to withstand many hours of rigorous performance marching. Coordinate player, coach and fan apparel in your team colors! We offer the most custom team uniform styles for every sport with the most decoration options. Superior Team is a proud distributor of athletic gear from top brands, including adidas, Asics, Champro, Holloway, Augusta, and more! Whether you're looking for day-to-day uniforms, event apparel, trade show attire, or all three, we have you covered! Superior Team Apparel carries a variety of styles from famous brands such as Eddie Bauer, Brooks Brothers, Calvin Klein, Patagonia Jackets, Port Authority, and much more. 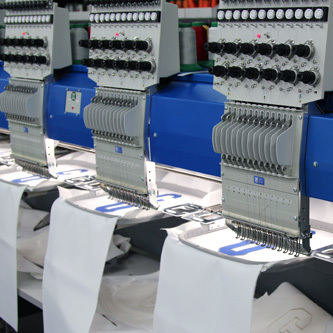 Only the most technologically advanced equipment is utilized to create any apparel design you can imagine including digital and screen printing, embroidery, appliqué, vinyl heat transfers, and glitter options. And with our in-house graphic design team, we work with you on your ideas.